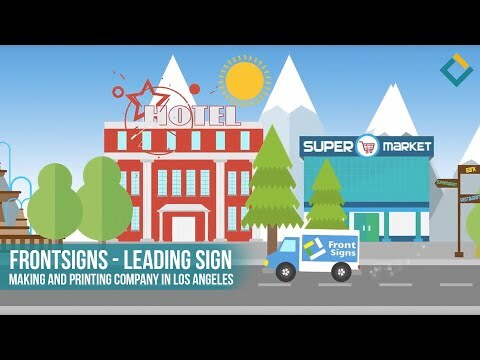 LOS ANGELES, CA, May 29, 2018 /24-7PressRelease/ -- Local signage-making/printing company in Los Angeles, Van Nuys is opening the doors for all visitors & tourists to its new showroom containing over 100 various signage samples. The company opened its new headquarters in Van Nuys, LA just in September 2016, however, due to its founders' decade-long experience in the printing & signage-making industry was able to quickly become one of the major printing houses in the Van Nuys area. All interested are welcome to attend the showroom in "Front Sign's" main headquarters located at 15101 Keswick St, Street, from 8:30 AM – 05:30 PM. "We created over a 100, different types of signs - warning signs, commercial signs, home signs, office signs – you name it – to give our clients and anyone else who might be interested a "taste" of our services. Some of our clients, picture the kinds of signs they want for their business or home but can't put their vision into words. Our new showroom with every kind of imaginable sign they might require will help them get a clearer understanding of what they really want and need and, on the other hand, help us ensure the final product we create perfectly matches their vision," said Gevorg Hambardzumyan, Founder, Front Sings, Los Angeles. Front Signs is an innovative printing house providing a wide spectrum of services in the signage-making, printing & cutting/engraving sectors since 2008. So far the company has served over 250 000 (one quarter million) B2B and B2C clients from various industries – starting with small mom-and-pop operations and ending with high-tech corporations. This short, 35-second video in a succinct manner tells about Front Signs and services they provide. For more information, visit Frontsigns.com or contact via Facebook page. For direct inquiries, contact Rose Babaian at (844)-833-1188 or send an email to hello@frontsigns.com.